The countrya��s first Ethiopian restaurant opens with meaty stews, dark brews and a dosa-like crepe. It is a a�?first-of-its-kinda��, wea��re told. There is no other restaurant in the country with an exclusively Ethiopian menu card. And yet ita��s not swish, but rather cosy. As we walk in (my wife and I) past the well-received and now appreciably busy dining halls of Meena Tai and Batlivala & Khanabhoy, we note that brothers Vikram Mohan and Uday Balaji have kept up their reputation of unique dining experiences. Well-curated, with artefacts of genuine Abyssinian heritagea��rough-hewn, hand-crafted furniture, Coptic-style Ethiopian memorabilia, and unusually-shaped indigenous string-instruments, like the masenqo and the krara��the space is welcoming. At the entrance, a collection of paintings depict traditional Ethiopian women in their unique garba��a recent gift from the Ethiopian ambassador, his Excellency Afsaw Dingamo Kame, Uday tells me. They make a wonderful addition to the wall-art that defines the dA�cor. But what distinguishes this address from others is the food. 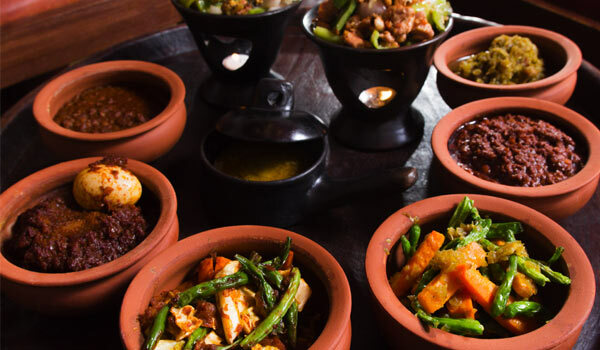 AtA� the Abyssinian, the assortment of wot, alicha and shiro (varieties of stews) and tibs (stir-fry) do fair justice to a rich and diverse cuisine. Central to the meal is the iconic injera, a large crepe-like flatbread. Made from fermented sourdough-like batter, it is vaguely similar to our own dosa in texture, and serves as the base for various curried accompaniments. Of these, the wot is first among many, served here in yebeg, beray and doro (lamb, beef and chicken) options for meat lovers, or misir, yeduba and dinich (red lentil, pumpkin and potato) for vegetarians. It is a thick onion-based stew with a strong berbere (a spice mix unique to Ethiopian food) seasoning, the bold flavour working nicely with the sourness of the injera. The alicha is milder, the turmeric and cumin distinguishing it from the wot, while the shiro has a chickpea base, giving it a more pasty consistency. We like the tibsa��meat lightly tossed with spices and niter kibbeh (spiced, clarified butter) and a few vegetablesa��and the fit-fit, traditionally a breakfast dish, made by tossing shredded injera with sautA�ed onions and tomatoes, not too dissimilar to our kothu parotta. Coffee certainly is Ethiopiaa��s most famous export, but as we find out, it is had very differently. A strong aromatic brew (black) is poured over a tablespoon or so of niter kibbeh, stirred with a pinch each of salt and sugar, and served with a side of popcorn. a�?I could get used to thisa��, Ia��m thinking as I find myself pouring a second cup, though maybe the popcorn is a bit too much. Meal for two at `1,600.